EconomicPolicyJournal.com: What the Hell is the Stock Market "Thinking"? What the Hell is the Stock Market "Thinking"? The only carbon units more delusional than the Donald about the distinctively un- awesome state of the US economy are the boys and girls who inhabit the canyons of Wall Street. They are being given every chance to get out of Dodge, but they keep bellying up to the bar for still another swig. Consider yesterday's doings. The White House actually confirmed during market hours that Trump is moving towards a 25% tax on Americans who buy goods made in China--- -and those are mostly the cheaper goods in the Wal-Mart aisles which represent what Flyover America can actually afford to buy. the White House might argue that people can still order soon-to-be more costly lamps, travel bags, canned tuna, vacuum cleaners and toilet paper on their trusty iPhones, which would remain tax-free under the latest Trumpian demarche. But if that's any consolation to the rank-and-file, you've got to wonder about Wall Street. The hideously over-valued S&P 500 dropped by the grand sum of 2.93 points (o.10%) at yesterday's close, and then took off for the races again today as if a potential $50 billion Trumpian war on the American consumer means nothing at all. Perhaps the Donald will eventually "calm down" as the Chinese government spokesman sensibly urged, and settle for something less draconian. As we explain below, we think that is highly unlikely and that the Donald's view of trade is so uniquely ego-driven, win- oriented and primitively mercantilist that he means to take his Trade War straight to the brink and beyond. But even short of that, how in the world can it be held that the risk of a Trade War that would materially disrupt that world economy and financial system is essentially zero--- at a time when the Oval Office is occupied by a trade policy madman, who absolutely does have the unilateral power to create mayhem in the global economy under the wide-open authorities of section 301 and section 232 of the trade acts? That's right. When the stock market is priced for perfection and then some----the risk of a major dislocation like a full-fledged trade war has to be close to zero in order to justify standing pat. That's because as the greatest bubble ever has reached it asymptotic high, the risk/reward equation has become radically asymmetrical to the downside. Accordingly, the cost of even a low probability plunge of the market averages far outweighs the meager gains still possible on the upside. There is no better evidence for today's radical asymmetry than the fundamental metric known as the Buffett indicator, which measures stock market capitalization relative to GDP. At 149% of GDP, the broadest possible stock index---the Wilshire 5000--now stands at the highest level ever recorded (its currently even higher than when the chart below was recently made). Accordingly, it towers far above the 104% level recorded on the eve of the Great Financial Crisis and now even significantly exceeds the 136% level tagged on the eve of the dotcom bust in March 2000. The operative word here is "tagged" because neither of those prior mania peaks lasted long. And shortly thereafter, of course, came a vertiginous plunge downward. In fact, getting from 136% of GDP to 72% over 2000-2002 meant the Wilshire 5000 lost 50% of its value. When it comes to the tagging action at the top, back then it was a race as to whether Microsoft, Cisco or GE would get to a market cap of $600 billion first. As it happened, Microsoft got there first on December 29,1999 and it stayed above this magic $600 billion threshold for all of six days-----before plunging by 65% and never returning for another 18 years! Microsoft was then already a powerhouse with $24 billion of sales and $10 billion of net income, but it was still the big cap canary in the casino that attested to the danger lurking in the entire market when the risk/reward ratio reaches nosebleed levels. Not surprisingly, they tagged another milestone today when Apple crossed the $1 trillion threshold---and apparently levitated the whole market with it. Yet the palpable risk of a Trade War on a scale unprecedented in the post-war era is every bit as dangerous today as any macroeconomic headwind facing the US economy back in March 2000; and, besides, the total public and private debt on the US economy back then stood at just $27 trillion and 270% of GDP. In the interim, America completed it selfie LBO and has made zero progress deleveraging since the 2008 financial crisis. Total debt today stands at $69 trillion and 345% of GDP, and is the real financial time bomb ticking under the soaring blue line in the chart below. Yes, we do understand that upwards of 50% of the traders on Wall Street today were still hanging around their frat house during the Lehman meltdown. So after nine years of buying the dip into win after win, a certain amount of insouciant confidence might well be expected. Still, as far as we know they have not yet actually eliminated the study of history from the college curriculum. So the Donald's mooted 25% tariff should at least have had a familiar ring. As it happened, the infamous Smoot-Hawley tariff of 1930 was in exactly the same zip code, averaging 22.7% on tariffed goods. To be sure, the economists are still debating the macroeconomic impact of Smoot- Hawley 88 years later; and some unreconstructed Keynesians, like Professor Barry Eichengreen, who is allegedly a foremost authority on global finance and the gold standard (he's dead set against it), hold that it actually functioned as a Keynesian-type stimulus! That's right. He and others of his ilk say it raised GDP by about 2.0%----even after accounting for the adverse impact of the 40% collapse in US exports which occurred between Q2 1930 and Q3 1932. Then again, the common folk of the day on both main street and wall street were not confused by such puzzle palace artifacts as today's DSGE (dynamic stochastic general equilibrium) models of the economy. Common sense and direct observations told them it was a catastrophe. 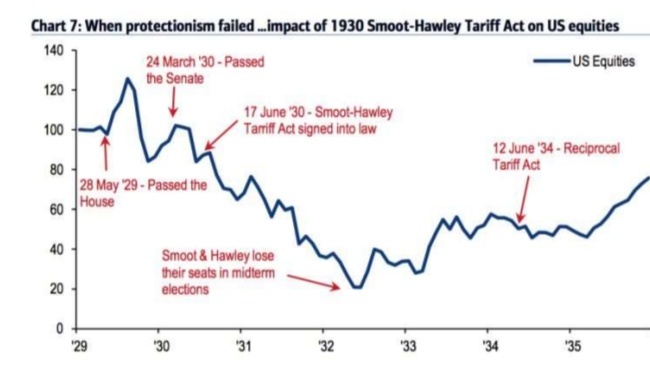 That's why main street threw both Reps Smoot and Hawley out of office in the next election, and also why the stock market declined by another 70% from the already depressed post-1929 crash level that prevailed in the spring of 1930. Here's the thing. Herbert Hoover was the single most economically literate President we have ever had and had become a billionaire-equivalent on today's wealth scale as a brilliant mining engineer, not simply a debt-bubble ridding real estate speculator. Hoover well understood the requisites of fiscal rectitude, free markets and sound gold- backed money. Even his affinity for a mild-form of protectionism was rooted in economics and commerce, and he hesitated about Smoot-Hawley to the very end. What we are saying is that once Washington started down the path of protectionism--- even with an economic mastermind and free market statesman in the Oval Office, it ended in disaster. Is it all so difficult, therefore, to imagine where this Trade War might lead with an absolute ignoramus and economic crackpot resident in the same powerful office? We use the term "crackpot" advisedly and deliberately. After 18 months of the Donald's trade tweets is it not obvious that he is clueless about both the underlying economics of global trade, as well as the immense---almost unfathomable----complexity of the worlds $17 trillion in annual merchandise trade turnover, and upwards of $25 trillion in total current account volume in goods and services? At bottom, the Donald thinks trade is purely a zer0-sum game where if you are not winning on the bilateral accounting ledgers, you are losing. That is, you are the "piggy- bank" that is being robbed by everyone else. Worse still, by the lights of the Donald the trade mugging that America is supposedly suffering doesn't even flow from the economics of costs, wages, productivity, technology, investment and competitive efficiencies, but essentially from politics and the alleged poor negotiating skills of the bone-heads who preceded him in office. So there is no real point in noting the obvious fact that tariffs of generally 2% +/- on the total value of imports among the DM economies are not the cause of the America's $800 billion trade deficit. Or that the US has nontariff barriers (NTBs) that are right up there with most other trading partners----particularly our "buy America" procurement policies that protect upwards of $1.5 trillion per year of defense, public infrastructure and nondefense government purchases. Moreover, the one thing that foreign trading partners do excel at----both the "socialist lite" countries of Europe, the mercantilist states of Japan and South Korea and the out- and-out centrally planned red capitalism of China----is subsidizing domestic exporters. It's what statist economic policies inherently do. Stated differently, the malefactors that the Donald wishes to make trade war upon are actually sending foreign aid and wealth transfers to the hard-pressed shoppers at Wal- Mart, Amazon and every other retail venue in-between. So in retaliation for the stupidity reining in the halls of state in Beijing, Tokyo, London, Paris etc., the Donald is essentially proposing to tax domestic consumers in order to punish foreign socialists. We will have more to say about where this is all leading in the final installment (Part 5), but the underlying point is that the Donald is not simply an economic protectionist of say the Pat Buchanan school. He's actually a full-throated statist who wants to Make America Great Again by making Washington more powerful and intrusive in economic affairs than ever imagined by FDR, LBJ, George McGovern or even Ron Dellums. And that's why Wall Street is so delusionally nonchalant about the impending Trade Wars. Trump doesn't want permanently high tariffs ala traditional protectionist prescriptions. Instead, he wants to use the club of threatened tariffs to force virtually every foreign nation to rearrange their domestic economies so as to meet Washington's specifications of fairness, and to cause bilateral trade imbalances to be drastically reversed in America's favor. Indeed, these art-of-the-deal bilateral arrangements would get so deep into the knickers of foreign economies as to give economic interventionism a whole new definition; and they would excavate vast new regions in the Washington Swamp-----that are today dry lands removed from the racketeering operations of the Imperial City---to accommodate the armies of lobbyists and consultants these Trumpian bilaterals would generate. The allegedly pending breakthrough on NAFTA with Mexico is a case in point. It is not about the kind of market based capitalist revival that would actually cure America's faltering economy. Instead, its about dictating the exact wage rates and geographic locale from which 5,000 pounds of steel, aluminum, copper, rubber, fabric, plastics and electronics may be turned into an automobile which is saleable in the US. What is coming down the pike from the Donald's real Trade War is briefly described below with respect to autos made in Mexico. In this case, of course, the newly elected quasi-Marxist president of Mexico might well welcome an order from Washington to raise wages in GM and Ford plants in Mexico to $16 per hour; and for that welcome windfall to Mexican workers to be paid for by American consumers. Mexico in May told the U.S. that it could be flexible on automotive wages and content, including acceptance of a requirement that at least 20 percent of a car’s value would come from higher-paid workers, in exchange for President Donald Trump’s negotiators withdrawing some of their other tougher demands. At the time, Lighthizer said the proposal wasn’t enough for the U.S., which had previously demanded that 40 percent of a car, and 45 percent of trucks, be made by workers earning wages of at least $16 per hour. Offers on regional content weren’t that far apart. While Mexico was willing to accept 70 percent of car components coming from Nafta countries, up from the current 62.5 percent, the U.S. called for 75 percent. Trump has threatened to impose sweeping new tariffs on imported vehicles in a possible attempt to pressure Mexico and Canada into striking a deal that would help drive manufacturing jobs back to the U.S. But here's the thing. Do we think there is a snowball's chance in the hot place that a $200 billion or $400 billion tariff threat would actually cause the Red Suzerains of Beijing to allow Robert Lighthizer & Co to reorganize the Red Ponzi to their specifications? The question answers itself and something more. Because the Donald basically sees trade as economic warfare, it is the Mother of all Trade Wars that is actually coming down the pike. So now more than ever would be a good time to run, not walk, to the nearest casino exit if you are still chasing the momo train. 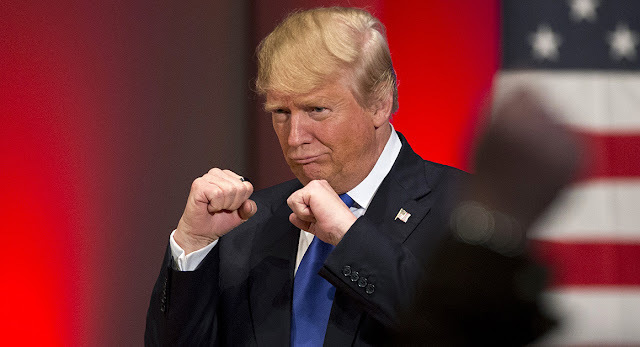 After all, the Apple today will most definitely not keep the next crash away---not when the Donald is coming hard upon the very warp and woof of the global economy. As we will explicate in Part 5, he need not bother sending his trade policy paratroopers to Beijing. The real culprit is domiciled only a few blocks away in the Eccles Building. It is the bad money from monetary central planners which caused America's giant trade deficits and the off-shoring of large swaths of its productive economy. Accordingly, salvation lies in a house-cleaning of the money-printers----not a new Washington trade politburo to restructure the world economy. The above originally appeared at David Stockman's Contra Corner.The above originally appeared at David Stockman's Contra Corner. 25% tax on Chinese goods = 25% currency devaluation.